The Landmark Difference Pays Big Dividends to the Care Provider. Providers become frustrated by the reports and, more importantly, become frustrated by their billing service’s inability to interpret the reports. Many billing services use software that will not produce the reports needed for good business decisions. 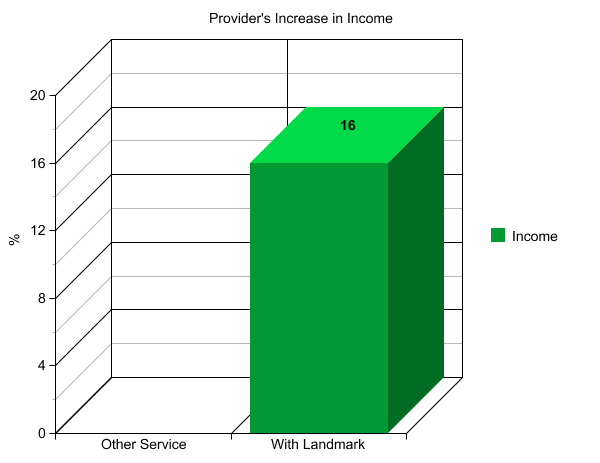 Providers’ incomes are hurt and they are powerless to do anything about it. Landmark’s software is extremely user-friendly and any customized report can be readily obtained. The Patient Aging Report and the Practice Analysis Report are the two key reports that providers use to make informed decisions. This can lead to the wrong procedural and diagnosis codes being entered, resulting in a higher percentage of insurance rejections and lower fees charged. A remarkable number of providers have received reduced payments because codes for treatment were interchanged with codes for check-ups. Codes for an MD as the provider were substituted with nurse care codes. The computer operators did not recognize the difference. They recognize incorrect codes and make the necessary adjustments as they do the work. There are fewer mistakes that need to be addressed at a later time. Unfortunately in a service-oriented business, one does what is needed unless a complaint is received. Action is taken only on that particular complaint. Attention is given to details. Steps are suggested to improve the provider’s bottom line. Fair market fees for comparable procedures are monitored allowing Landmark’s providers the option of raising their rates.